Concorde (Pyrus communis 'Concorde') is a well-known pear that is sweet and juicy to eat and excellent for general kitchen use. 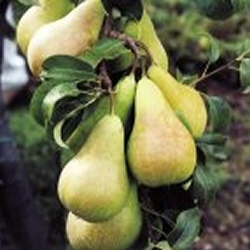 Being self-fertile, you only require one pear tree to be guaranteed your very own pear crop. We have found crops to be very heavy and it is also compact in form. This pear is in flowering period is C4. This pear will act as a suitable pollination partner for pears in the flowering periods C3, C4 and C5. This variety of pear tree is supplied in a 12 litre container, which means that the tree can be planted any time of the year and with better results than either bare-root or rootballed trees. A free personal message can be added to this order, just write it at checkout.